Shiny – From SpongePedia, the biggest SpongeBob-wiki in the world! Shiny is Bubble Buddy's son. He only appears in the episode Bubble Buddy Returns. He doesn't seem to talk much and is rather small. He was left with SpongeBob to be looked after, as his father was running errands. His activities in Bikini Bottom are reminiscent of his father's, where the seemingly inanimate bubble inadvertently causes trouble and angers everyone they come in contact with. 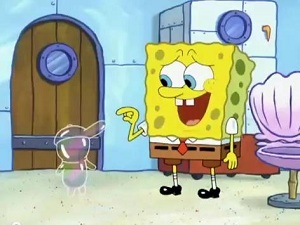 However, unlike Bubble Buddy, Shiny's seemingly innocent floating could be seen as intentional, and resulted in SpongeBob chasing after him in attempts to save him from being popped by hazardous objects. Shiny resembles his father, only much smaller, and he wears a baseball cap. Shiny is also described as a mischievous character who causes trouble to everyone around him. At the end of his episode, he also blows a raspberry at SpongeBob. Shiny has the ability to sprout two heads. His father however, corrects this by placing him in a bubble bottle and blowing him back out again. This page was last modified on 30 December 2015, at 18:23.